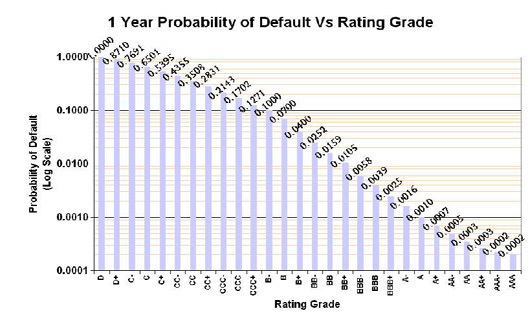 Knowing both the Expected Loss and the Loss Given Default, we are able to calculate the Probability of Default (PDF) which is independent of our Loss Given Default assumption (see our Financial Technology page for further discussion of default probability calculations). 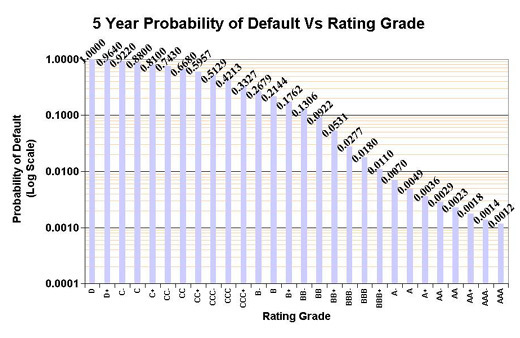 As well as presenting raw numbers, the PDF is translated into a rating by applying the non-linear rating intervals presented in the graphs below. The figure given is the upper limit for the risk to be classified within that interval. Click here to download the excel version of the charts. Ratings are based purely on the PDF, they do not take into account company size or other quantitative factors, we provide a purely quantitative-based rating, leaving users to make adjustments based on qualitative factors as they see fit.